Bridled Tern seeking shelter on our balcony. Cyclone Oswold is playing in the Pacific off the east coast of Australia. As a result, we are anchored in the protective harbor of Moreton Bay, 8 miles off Brisbane. Originally we were supposed to be able to continue our travels this afternoon, but the storm is moving slowly. The port of Brisbane is closed and no ships are allowed in or out of the bay at least until tomorrow morning. We are safe here, but it has been raining continuously all day. 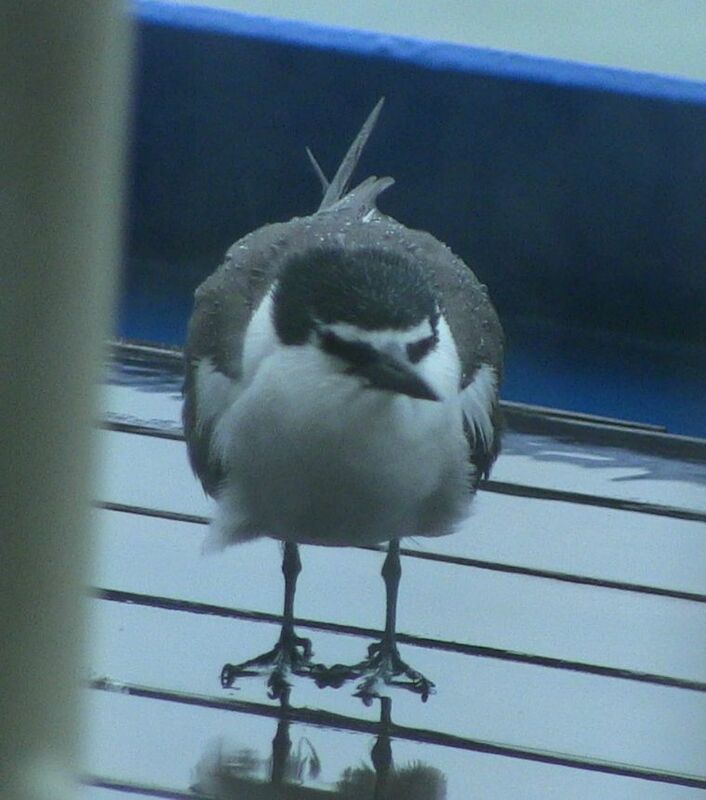 The weather is so bad, a Bridled Tern has taken refuge on our deck and has been there for several hours. We are doing our best not to frighten it away. As long as we are anchored here the ship is fairly stable. We've had a nice day at sea. This morning we attended a lecture on "The Great Barrier Reef" by Captain Wallace Cray. He explained that, in addition to harbor pilots, there are a few sea pilots with special knowledge of certain tricky areas along coasts. Captain Cray is a pilot for the Great Barrier Reef. He gave a great talk about how the reefs were discovered and where the shipping lanes are. This afternoon I went to another art lecture. This one was on the American Pop Artists. Mostly this was on Peter Max, with a little about Andy Warhol thrown in. I really like this art style, so I enjoyed hearing about it's history. Both Max and Warhol started out as billboard painters and became famous using imaginative color to depict recognizable subjects. In addition to his success in poster art and serigraphs, Peter Max has done a lot of work for charitable causes. He is the one who, along with Lee Iacocca, raised the funds for the restoration of the Statue of Liberty. Tonight was the traditional Regent block party. Everyone went out into the halls at 6pm to meet our neighbors and enjoy wine and hors d'oeuvres. One couple down the hall continued on from Auckland like we have but most of the people in our area got on in Sydney. 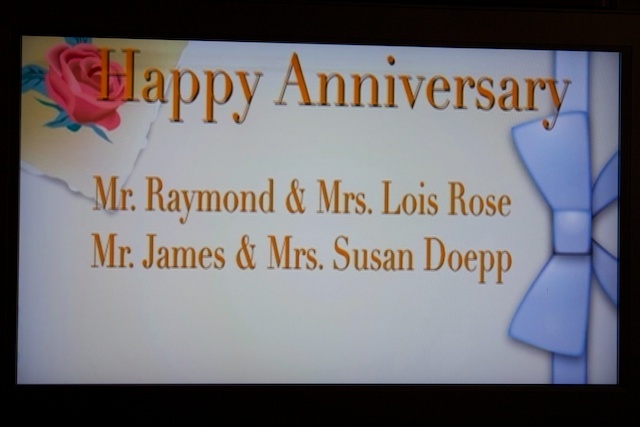 Today is our 34th wedding anniversary. We are very happy to be in calm waters, because we have a reservation at one of the specialty restaurants on board tonight, Prime 7. We are looking forward to some good wine and a good steak to celebrate.